Shopping for Game of Thrones Kitchenware? The house sigils of Westeros are among the most recognized fantasy artwork of the last decade. Now you can bake with silicone baking trays that feature the sigil of Stark. 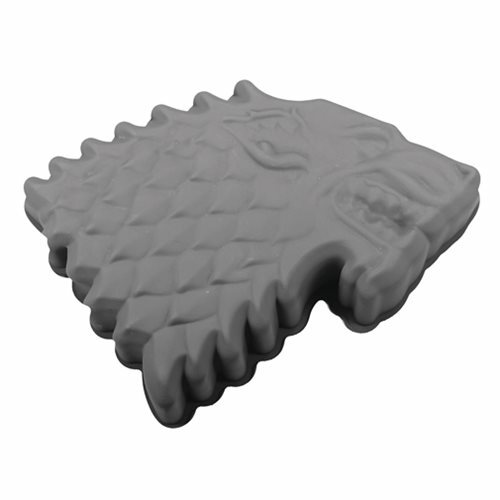 This Game of Thrones Stark Sigil Silicone Baking Tray is perfect for making cakes, puddings, and even ice blocks! Heat and cold resistant. Hand wash only. Not dishwasher safe. Product has a heatproof temperature of 446° F / 230°C and a cold resistance temperature of 40°F / -40°C. Made of silicone rubber. Ages 14 and up.